Pressely Ridge Ohiopyle is 1,600 acres located in the Laurel Mountains of Pennsylvania. 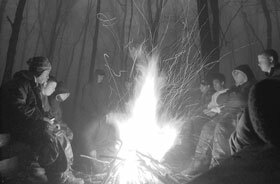 Heavy winter snows can close the camp to incoming traffic, creating a sense of isolation in this wilderness. It may seem a strange place to take troubled urban youth who have been involved with drugs and associated with gangs and criminal activity but not to Ric Renquest, MA, MBA, and Jim Natural, MA. Renquest, the program director, and Natural, educational services coordinator, believe that daily living under such circumstances can be therapeutic. Situations campers face in the wilderness can be used to teach better coping mechanisms for the social stresses they encounter when they return to their home environment. “You bring kids into the woods away from their failed multiple placements, and it can be an earth-shattering experience,” says Renquest. “I had a young man, it was his very first day. He was transported by a police officer, and the officer had him handcuffed and hobbled. The young man showed up at the front door, and I was going out to do his intake. I told the officer to cut him loose. The officer said, ‘He’s going to run.’ The kid looked around, and his eyes hit the base of a 100-foot poplar tree. He started at the bottom and looked all the way up to the top. He looked at me and said, ‘Dang, I’ve never seen anything like that before.’ He had no place to run and a new environment in which to learn,” says Renquest. Just as important as adapting to a new environment, a solid relationship with the counselor is key to a successful experience in wilderness programs, according to Natural. “When kids come to Pressely Ridge, they are naturally resistant to bonding with adults. Adults have failed them. The wilderness environment accelerates the change in relationships that needs to occur. Campers rely on adults to teach them the skills necessary for survival in this new environment,” says Natural. These necessary skills include building a proper fire or not pitching a tent under a widow maker, a deadly tree when it comes tumbling down during a storm. Relationships are critical to change and form one of the six core values of the Pressely Ridge program. Campers call and visit Pressely Ridge long after they have left. Just recently, Renquest and Natural met with campers with whom they worked two decades ago. 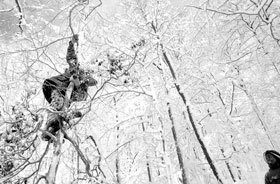 Shannon Szwarc, a photojournalist and author of Wilderness Within, Wilderness Without, a book on the therapeutic wilderness camp at Ohiopyle, was one of those troubled youths back in 1989 when he was sent to the program for 10 months at the age of 15. “We moved from the suburbs of Akron to the suburbs of Pittsburgh. I was stuck in junior high at the time and had a real tough time making friends. The only guys who, of course, would accept me were the troublemakers. I was very young and very susceptible to peoples’ thoughts and ideas. I was 13, 14 years old. I just wanted friendship. The few friends I had were antisocial and that became my identity. I wore that as a badge,” says Szwarc. Szwarc’s parents signed him over to the court system for skipping school, fighting, disappearing from home for days at a time, and drug involvement. He was admitted to Pressely Ridge on Valentine’s Day 1989 and that was great parenting, according to Szwarc. Szwarc has no doubt that without the help of Pressely Ridge, his situation would have gotten worse. Alex Cameron, who wrote the afterward for Szwarc’s wilderness book, was one of three counselors who were a tremendous influence in Szwarc’s life. Szwarc explains the importance of relationships in the wilderness change experience. “Relationship is paramount. If the camper doesn’t trust you, if he doesn’t believe in you, if he sees you as a farce, there is nothing you are going to do to influence that kid. On the other hand, if the camper sees you as real and you show him through your actions how to behave appropriately and that setting boundaries is not just punishment because you see him doing right as well as wrong, then you can become a tremendous influence,” says Szwarc. Once campers know what healthy relationships look like, they have skills for staying away from unhealthy relationships, if they choose to do so. Chief Cameron deeply influenced Szwarc in these ways. Chief is a title of respect still used today to address teachers/counselors at Pressely Ridge. For Szwarc, photographing for the book was coming full circle. “From the production phase, I had a lot of moments when I was putting the camera down out of choice to counsel kids. I went through the same training as all the other counselors had before I started working on the book. I really liked building those kinds of relationships and having that kind of influence on a young mind. Everything echoed of when I was a kid—sort of like coming full circle, learning from my mistakes, to visiting old ghosts. It felt good; it felt as if I was giving back, saying thanks to my parents, saying thanks to the counselors that helped me,” he says. Pressely Ridge, formed through a 1969 merger between the Protestant Orphans Asylum founded in 1832 and the Pittsburgh and Allegheny Home for the Friendless, is celebrating its 175th anniversary this year. Presently, they offer programs in eight states; Washington, DC; Portugal; and Hungary. They have 1,200 employees and 600 foster parents. Their programs follow the reeducation model of Nicholas Hobbs, a psychologist and provost of Vanderbilt University. His reeducation model views emotional and behavioral disturbances as situations that need re-education rather than evidence of pathology. 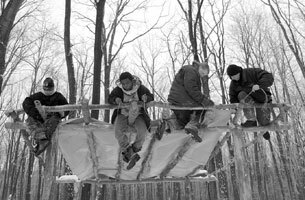 “Re-ed” is popular among wilderness-based and other experiential programs. Physicians, counselors, social workers, psychiatrists, and other experts who are part of the team support the teachers/counselors who work with the children.